For me, the year 1968 was the beginning of a remarkable life in Central America. However, the year would not have been as significant had it not been for the tremendous influence upon my life by Dr. L. Nelson Bell. To the average layman, his name is not well known. Most people who do recognize his name associate him with Billy Graham, his son-in-law. Dr. Bell had been a medical missionary in China for many years and, because of the Communist takeover, had been forced to return to the United States and retire. He and his lovely wife moved into their rock home on the main street of Montreat, North Carolina, across the street from their daughter and her famous evangelist husband. In China he had lived an extremely active life; therefore, living in this small community his life style changed tremendously. An average day began at 5:00 am and after his quiet time he would not make the rounds of a hospital but would begin to write for different Christian periodicals. Most of the remaining time of a day he would be on the telephone with some of America's best-known Christians. Through his pastor, Dr. Calvin Thielman, I was introduced to this giant of a man. 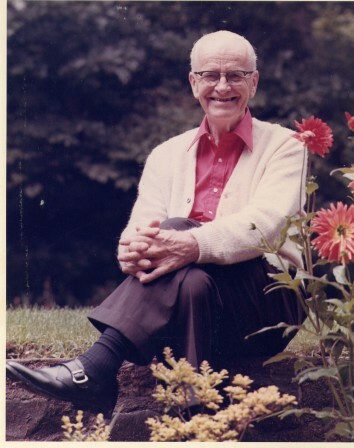 Even though Dr. Bell, as I would always call him, was almost old enough to be my grandfather, we immediately developed a warm and lasting relationship. Several times a week, I would receive a call at 6:00 am and without waiting to hear who it was, I would say, "Good morning, Dr. Bell." I looked forward to every opportunity I had to be with him, and I considered a wake-up call from him as a genuine blessing. His office was in the basement of his home and the access to it was through the back of the house. On my first trip downstairs, he said "Charles, I want to show you something that I rarely show to anyone." I could not imagine what he was going to say or do, but he took me over to the door at the foot of the steps and opened it back from the wall and there was a picture of himself shaking hands with President Lyndon Johnson. He said (almost ashamedly), He said (almost ashamedly), ""I feel obligated to keep his picture on my wall because he spent 15 minutes talking to me." 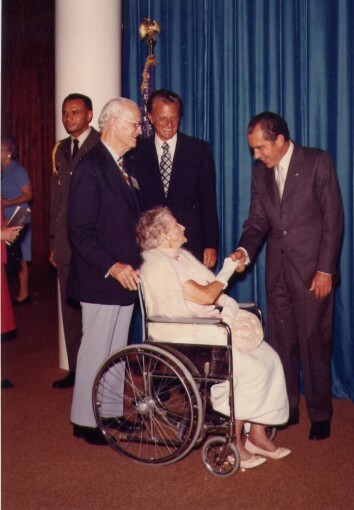 Several years later he gave me a picture of he and Mrs. Bell (in a wheel chair) shaking hands with President Richard Nixon, and he showed no regret for having met this President. This was in 1968. One morning I came through the back door of the house, as was my custom, and went downstairs, where I found him talking on the telephone with the then editor of "Christianity Today," Dr. Carl Henry. It was my privilege to hear him suggest and then highly recommend Dr. Harold Lindsel as Dr. Henry's replacement. A few weeks later I read in the newspaper that this change had transpired. To a young man who would be leaving for Central America in a few months, listening to this extremely important conversation was something to remember. Dr. Bell was the one who suggested to Billy Graham the idea of the periodical that would eventually be named "Christianity Today," and of which he would be the first editor. One Sunday afternoon as I was on the way to preach, I stopped by Dr. Bell’s to discuss with him the way things were developing for a county-wide meeting (Christians Sharing Christ), that God had led me to put together in the Asheville Convention Center. Unbeknownst to me, I would interrupt a small birthday party for the Bells' other son-in-law whom I had previously met. I walked into the living room and was shocked to find myself face to face with Billy Graham. He shook my hand and then offered me a pecan from a dish he was holding. I didn't want a pecan but didn't know what to do, so I picked one up and held it in my sweaty palm for ten or fifteen minutes until I was served a piece of cake. Dropping the pecan onto the cake plate and sliding it under the cake was awkward and, to further cover up what I had done, I had to eat the pecan with the cake. Dr. Bell and I talked as Billy sat attentively in between us. The next morning I told Dr. Bell, "Here I was, with an opportunity of a lifetime to get to know Billy and I spent all my time talking to you." We both laughed and agreed that this was evidence that I was doing what God wanted me to do and that I was not being attracted away from being obedient to His will. Billy did interrupt our conversation one time by asking if the pastor of the First Baptist Church of Asheville was supporting our meeting. I told him no, which did not surprise him. Years later, this same pastor would be one of the leaders of the liberal wing of the Southern Baptists -- those who do not believe that the Bible is the inspired word of God. 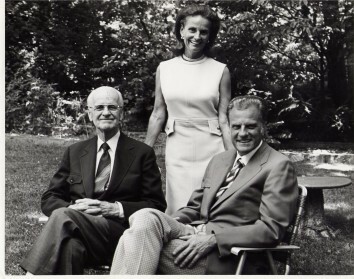 In the early seventies, I passed through the Asheville area and made my last visit to see Dr. and Mrs. Bell. He and I sat and talked for some time about my ministry in Costa Rica and about my spiritual growth, which had always been at the center of his attention. During this conversation he would tell me of the trip that he and Mrs. Bell had taken to visit one of their daughters in California. At the age of 85, he and Mrs. Bell had traveled by automobile from North Carolina across America to Los Angeles. What makes this story so remarkable is that Mrs. Bell was confined to a wheel chair, which required him to pick her up to get her in and out of the wheelchair, and all of this at his age. He told me something remarkable, which was hard for me to understand at that time in my life. He said, "I enjoy having to take care of Mrs. Bells every need." About 6 years later I would come to identify with what he meant, when my wife and the love of my life was confined to bed for several months. Like my dear friend Dr. Bell, I also enjoyed, having to take care of the one I loved. Dr. L. Nelson Bell is one of three Christian men who have had the greatest influence and impact on my spiritual walk with the Lord. For years, I have said that Dr. Bell disciplined or discipled me. The other two who played a strong role in my Christian walk and ministry were Dr. Cal Guy and Rev. Ron Dunn. All three are already in the presence of my Lord.